Previously, we went over how the new WebP image format compared to the traditional JPG. One neat thing about WebP is that, unlike JPG or PNG, WebP has the ability to use either lossy or lossless compression, with or without transparency. While JPG is traditionally used to display photos, which have a high level of detail and are generally more complex and can suffer from a little bit of detail loss as a tradeoff for compression, WebP can also be used like a PNG, which is often used for web graphics with transparency or subtle patterns. Like the previous test, we’ll use a baseline image in a “traditional” format to compare the WebP file with. Because WebP is capable of storing alpha transparency (a key feature of PNG and one of the primary reasons to use the format) in a lossy image, we’ll use a couple of images– the baseline PNG, a losslessly compressed WebP image, a lossy (with alpha) image at a quality of 100, and a lossy image (with alpha) at a quality of 80. All of the previously listed formats are capable of alpha transparency. In these tests, the alpha_q quality was set to the default of 100. Once again, we’ll use Google’s precompiled WebP encoder cwebp version 0.3.0, which is available for a variety of platforms on the official WebP download page. The command to output a lossless image from a source PNG file is cwebp -lossless [input] -o [output]. As with the JPG vs. WebP comparison, the command used to generate a lossy WebP file is cwebp -q [quality] [input] -o [output]. 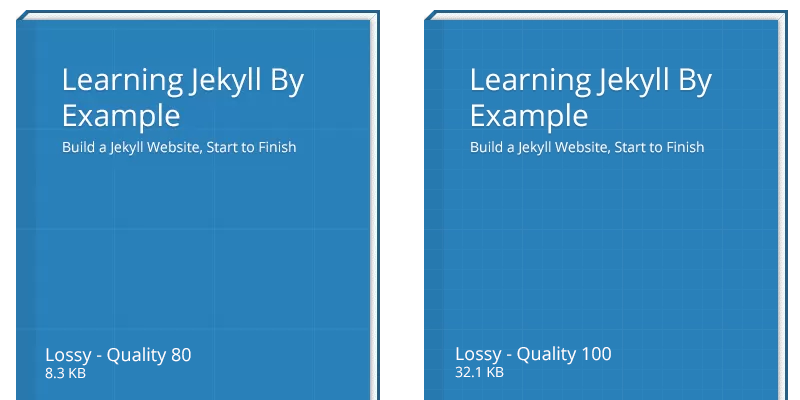 If you’ve seen my new home page design, you might have noticed the graphic of a book cover for “Learning Jekyll By Example.” This graphic has relatively low complexity compared to a photograph, and also has transparency. Due to these two factors, I chose to use PNG as the image format to embed the graphic in my website. Now, let’s see how WebP compares to PNG. The original PNG image is 30.2 KB, versus the lossless WebP at 8.9 KB. You can download either of the source images with the links below, though they will look the same due to the lossless compression. You will need a WebP compatible image viewer, such as Google Chrome or Opera, to view the WebP file. On the other hand, the lossy versions of the book cover have some quality loss depending on the quality setting used. Below I’ve included a screenshot of the book cover image at different quality settings for those that do not have a WebP capable browser, though you can also download the source files for your own comparison. Note, you can click on any of the images in this post to view them full size and view them without your browser resizing the images. As you can see, the lossy compressed WebP file has some noticeable detail loss. The biggest issue you can see is with the grid lines on the book cover, which have disappeared in some areas due to the compression. This also occurs at a quality setting of 90 (note: not shown). However, the lossy image at quality 100 looks fine with little to no quality loss compared to the lossless versions. It should be noted that, with this image, the lossless image is actually smaller than the lossy image at quality 100, and comparable in file size to the lossy image at quality 80, though with no detail loss. With this image, it’s clear that the lossless WebP encoder wins. Next, we’ll test a ticket graphic by Premium Pixels. While the image does not have any transparency, the subtle pattern detail in the background and ticket graphics make it a prime candidate for PNG. JPG, or any other lossy format, will potentially reduce or eliminate this texture at higher compression settings. The original PSD source file was saved as a PNG to serve as a baseline. The baseline PNG has the Photoshop setting “smallest/slow” enabled for compression, and no interlacing. The original PNG comes in at a hefty 243 KB– not ideal for mobile connections or visitors with lower bandwidth connections. In contrast, the lossless WebP image file is 183 KB in size. While it’s a little bit smaller, we can still do better in terms of compression as the file is a little large. The lossy images compared below come in at a smaller size than the lossless equivalent, unlike the previous test with the book cover graphic in which the lossless graphic was actually smaller than any of the lossy files. For comparison, you can see the differences between a quality setting of 100 and 80 below. As you can see, the lossy compression resulted in artifacts at a quality of 80. In fact, if you compare the baseline (or even the lossy-100 WebP) file to the quality-80 WebP, you will notice significant reduction in texture detail– especially in the background, which has effectively become a blocky radial gradient. 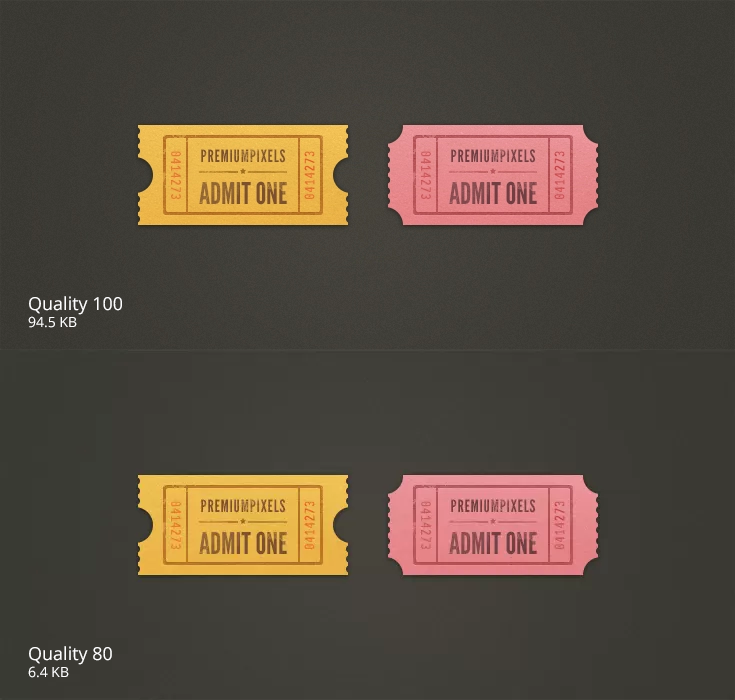 The tickets themselves also show a reduction in texture in the lossy compressed WebP with a quality of 80. However, the lossy compressed WebP file at a quality of 80 has a file size that is a mere 2.6% of the original baseline PNG image– impressive for the amount of detail retained in the compressed file. Coming in at 8.3 KB, the above JPG at quality 3 looks downright terrible compared to the WebP at a quality of 80 (and a file size of 6.5 KB). In addition, these file sizes were only achieved after being run through ImageOptim. If you want to learn more about (the fantastic, and free) ImageOptim or other image optimization tools, why not check out my upcoming web course Extreme Website Performance”? The WebP, even though it is smaller in file size than the JPG, has significantly more detail around the edges of the ticket and the gradient in the background is much smoother. While neither the WebP quality-80 or JPG quality-3 images are high enough detail to view the subtle textures in the image, WebP clearly wins for quality and file size against JPG in this test. Depending on the image, it may or may not be beneficial to use the lossy WebP format. Images that require transparency may need to experiment with different lossy quality settings, or even the quality of the alpha channel (by default, in all of the images above, the alpha quality was 100). However, in the ticket example, it’s clear that the lossy WebP compression can reduce the file size of web graphics significantly without any discernible detail loss.